1. We are locally owned and managed. 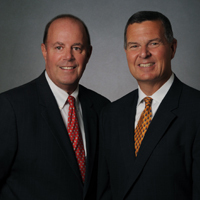 Sean O'Conor and Tom Mooney are hands-on managers with more than 60 years of combined experience and are always accessible. 2. We have a wide regional presence with offices in Lutherville, Jacksonville and Federal Hill. 4. There is no required use of company owned services such as mortgage, title, home warranty or insurance. We do what serves our client's best interest. 5. We have an enhanced website with opportunity for agent/team individual sites and pages, map searches, seller reports and immediate updating from the MLS. 6. Web-based e-mail and Contracts programs that work from any computer - anywhere. 7. All of our offices have wireless internet access for laptop computers. Offices also have multi-purpose copiers/scanners with scan to e-mail capability. 8. We have an excellent commission plan based on gross commission income, not income earned after commission split. 9. We maintain a flexible company approach for obtaining listings/business in the field. 10. You may have your own personal desk space. 11. We are committed to providing enthusiastic and fun atmosphere that fosters high energy, continuous growth, community involvement and ethical performance.